It corresponds to the term (Lx.A)B which reduces to A[x=B], i.e to the term A where all instances of x have been replaced by B. In Christopher P. Wadsworth, Semantics and Pragmatics of the Lambda Calculus , DPhil thesis, Oxford, 1971, and later John Lamping, An algorithm for optimal lambda calculus reduction, POPL ’90 Proceedings of the 17th ACM SIGPLAN-SIGACT symposium on Principles of programming languages, p. 16-30, there are proposals to replace the beta rule by a graph rewrite on the syntactic tree of the term. These proposals opened many research paths, related to call by name strategies of evaluations, and of course going to the Interaction Nets. The beta rule, as seen on the syntactic tree of a term, is a graph rewrite which is simple, but the context of application of it is complex, if one tries to stay in the real of syntactic trees (or that of some graphs which are associated to lambda terms). This is one example of blindness caused by semantics. Of course that it is very difficult to conceive strategies of applications of this local rule (it involves only two nodes and 5 edges) so that the graph after the rewrite has a global property (means a lambda term). But a whole world is missed this way! In chemlambda the rewrite is called BETA or A-L.
Nice. it almost verbatim the same thing. Remark that the command”let” appears as a port variable too. The price is that even if we start with a graph which is related to a lambda term, after performing such careless rewrites we get out of the realm of lambda terms. But there is a more subtle difference: the nodes of the graphs are not gates and the edges are not wires which carry signals. by a simple combination of the beta rewrite and those rewrites from the DIST family I wrote about in the post about duplicating trees. So, we get out of lambda calculus, what’s wrong with that? Nothing, actually, it turns out that the world outside lambda, but in chemlambda, has very interesting features. Nobody explored them, that is why is so hard to discuss about that without falling into one’s preconceptions (has to be functional programming, has to be lambda calculus, has to be a language, has to have a global semantics). I’m a supporter of “no semantics” and I’ll try to convince you that it is nothing vague in it. Take any formalism. To any term built from this formalism there is an associated syntactic tree. Now, look at the syntactic tree and forget about the formalism. Because it is a tree, it means that no matter how you choose to decorate its leaves, you can progress from the leaves to the root by decorating each edge. At each node of the tree you follow a decoration rule which says: take the decorations of the input edges and use them to decorate the output edge. If you suppose that the formalism is one which uses operations of bounded arity then you can say the following thing: strictly by following rules of decoration which are local (you need to know only at most N edge decorations in order to decorate another edge) you can arrive to decorate all the tree. Al the graph! And the meaning of the graph has something to do with this decoration. Actually the formalism turns out to be not about graphs (trees), but about static decorations which appear at the root of the syntactic tree. But, you see, these static decorations are global effects of local rules of decoration. Here enters the semantic police. Thou shall accept only trees whose roots accept decorations from a given language. Hard problems ensue, which are heavily loaded with semantics. Now, let’s pass from trees to other graphs. The same phenomenon (there is a static global decoration emerged from local rules of decoration) for any DAG (directed acyclic graph). It is telling that people LOVE DAGs, so much so they go to the extreme of excluding from their thinking other graphs. These are the ones who put everything in a functional frame. Decorated graphs have a long tradition in mathematics, think for example at knot theory. In knot theory the knot diagram is a graph (with 4-valent nodes) which surely is not acyclic! However, one of the fundamental objects associated to a knot is the algebraic object called “quandle”, which is generated from the edges of the graph, with certain relations coming from the edges. It is of course a very hard, fully loaded semantically problem to try to identify the knot from the associated quandle. The difference from the syntactic trees is that the graph does not admit a static global decoration, generically. That is why the associated algebraic object, the quandle, is generated by (and not equal to) the set of edges. There are beautiful problems related to the global objects generated by local rules. They are also difficult, because of the global aspect. It is perhaps as difficult to find an algorithm which builds an isomorphism between two graphs which have the same associated family of decorations, as it is to find a decentralized algorithm for graph reduction of a distributed syntactic tree. But these kind of problems do not cover all the interesting problems. What if this global semantic point of view makes things harder than they really are? Just suppose you are a genius who found such an algorithm, by amazing, mind bending mathematical insights. Your brilliant algorithm, because it is an algorithm, can be executed by a Turing Machine. Or Turing machines are purely local. The head of the machine has only local access to the tape, at any given moment (Forget about indirection, I’ll come back to this in a moment.). The number of states of the machines is finite and the number of rules is finite. This means that the brilliant work served to edit out the global from the problem! http://chorasimilarity.github.io/chemlambda-gui/dynamic/turingchem.html , if you love TM ) which is definitely local and Turing universal. It works by the brilliant algorithm: do all the rewrites which you can do, nevermind the global meaning of those. Oh, wait, what about a living cell, does it have a way to manage the semantics of the correct global chemical reactions networks which ARE the cell? What about a brain, made of many neural cells, glia cells and whatnot? By the homunculus fallacy, it can’t have static, external, globally selected functions and terms (aka semantic). On the other side, of course that the researcher who studies the cell, or the brain, or the mathematician who finds the brilliant algorithm, they are all using heavy semantic machinery. Not that the cell or the brain need the story in order for them to live. In the animated gif there is a chemlambda molecule called the 28 quine, which satisfies the definition of life in the sense that it randomly replenish its atoms, by approximately keeping its global shape (thus it has a metabolism). It does this under the algorithm: do all rewrites you can do, but you can do a rewrite only if a random coin flip accepts it. Most of the atoms of the molecule are related to operations (application and abstraction) from lambda calculus. I modified a bit a script (sorry, not in the repo this one) so that whenever possible the edges of this graph which MAY be part of a syntactic tree of a lambda term turn to GOLD while the others are dark grey. They mean nothing, there’s no semantics, because for once the golden graphs are not DAGs, and because the computation consists into rewrites of graphs which don’t preserve well the “correct” decorations before the rewrite. There’s no semantics, but there are still some interesting questions to explore, the main being: how life works? There is no such thing as no-semantics. Every system that YOU deal with is described by you and observed by you with some language that you use. At the very least the system is interpreted in terms of its own actions and this is semantics. But your point is well-taken about not using more semantic overlay than is needed for any given situation. And certainly there are systems like our biology that do not use the higher level descriptions that we have managed to observe. In doing mathematics it is often the case that one must find the least semantics and just the right syntax to explore a given problem. Then work freely and see what comes. Then describe what happened and as a result see more. The description reenters the syntactic space and becomes ‘uninterpreted’ by which I mean open to other interactions and interpretations. It is very important! One cannot work at just one level. You will notice that I am arguing both for and against your position! Thanks! Looks that we agree in some respects: “And certainly there are systems like our biology that do not use the higher level descriptions that we have managed to observe.” Not in others; this is the base of any interesting dialogue. We do claim however, that there need be no explicit representation of either the world or the intentions of the system to generate intelligent behaviors for a Creature. Without such explicit representations, and when viewed locally, the interactions may indeed seem chaotic and without purpose. I claim there is more than this, however. Even at a local level we do not have traditional AI representations. We never use tokens which have any semantics that can be attached to them. The best that can be said in our implementation is that one number is passed from a process to another. But it is only by looking at the state of both the first and second processes that that number can be given any interpretation at all. An extremist might say that we really do have representations, but that they are just implicit. With an appropriate mapping of the complete system and its state to another domain, we could define a representation that these numbers and topological connections between processes somehow encode. It is interesting that some people (yourself it would seem) get comfort from the thought that there is no central pattern. I think that we might ask Cookie and Parabel about this. Cookie and Parabel and sentient text strings, always coming in and out of nothing at all. Well guys what do you think about the statement of MInsky? Cookie. Well this is an interesting text string. It asserts that there is no central locus of control. I can assert the same thing! In fact I have just done so in these strings of mine. the strings themselves are just adjacencies of little possible distinctions, and only “add up” under the work of an observer. Parabel. But Cookie, who or what is this observer? Cookie. Oh you taught me all about that Parabel. The observer is imaginary, just a reference for our text strings so that things work out grammatically. The observer is a fill-in. We make all these otherwise empty references. Parabel. I am not satisfied with that. Are you saying that all this texture of strings of text is occurring without any observation? No interpreter, no observer? Cookie. Just us Parabel and we are not observers, we are text strings. We are just concatenations of little distinctions falling into possible patterns that could be interpreted by an observer if there were such an entity as an observer? Parabel. Are you saying that we observe ourselves without there being an observer? Are you saying that there is observation without observation? Cookie. Sure. We are just these strings. Any notion that we can actually read or observe is just a literary fantasy. Parabel. You mean that while there may be an illusion of a ‘reader of this page’ it can be seen that the ‘reader’ is just more text string, more construction from nothing? Cookie. Exactly. The reader is an illusion and we are illusory as well. Cookie. Precisely, you are not! Parabel. This goes too far. I think that Minsky is saying that observers can observe, yes. But they do not have control. Parabel. Yes, but no ultimate control. An observer is just a kind of reference that points to its own processes. This sentence observes itself. Cookie. So you say that observation is just self-reference occurring in the text strings? Parabel. That is all it amounts to. Of course the illusion is generated by a peculiar distinction that occurs where part of the text string is divided away and named the “observer” and “it” seems to be ‘reading’ the other part of the text. The part that reads often has a complex description that makes it ‘look’ like it is not just another text string. Cookie. Even text strings is just a way of putting it. We are expressions in imaginary distinctions emanated from nothing at all and returning to nothing at all. We are what distinctions would be if there could be distinctions. Parabel. Well that says very little. Cookie. Actually there is very little to say. Parabel. I don’t get this ‘local chaos’ stuff. Minsky is just talking about the inchoate realm before distinctions are drawn. Parabel. Are you becoming inchoate? Dear Louis, I see that the Minsky reference in the beginning of the quote triggered a reaction. But recall that Minsky appears in a quote by Brooks, which itself appears in a post by Marius, which is a follow up of an older post. That’s where my interest is. This post only gathers evidence that what I call “no semantics” is an idea which is not new, essentially. So let me go back to the main idea, which is that there are positive advances which can be made under the constraint to never use global notions, semantics being one of them. As for the story about Cookie and Parabel, why is it framed into text strings universe and discusses about a “central locus of control”? I can easily imagine Cookie and Parabel having a discussion before writing was invented, say for example in a cave which much later will be discovered by modern humans in Lascaux. I don’t believe that there is a central locus of control. I do believe that semantics is a mean to tell the story, any story, as if there is a central locus of control. There is no “central” and there is very little “control”. This is not a negative stance, it is a call for understanding life phenomena from points of view which are not ideologically loaded by “control” and “central”. I am amazed by the life variety, beauty and vastness, and I feel limited by the semantics point of view. I see in a string of text thousands of years of cultural conventions taken for granted, I can’t forget that a string of text becomes so to me only after a massive processing which “semantics” people take as granted as well, that during this discussion most of me is doing far less trivial stuff, like collaborating and fighting with billions of other beings in my gut, breathing, seeing, hearing, moving my fingers. I don’t forget that the string of text is recreated by my brain 5 times per second. And what is an “illusion”? In the last post https://plus.google.com/+MariusBuliga/posts/K28auYf69iy I gave two quotes, one from Brooks “Intelligence without representation” (where he quotes Minsky en passage, but contains much more than this brief Minsky quote) and the other from Braitenberg “Vehicles: Experiments in Synthetic Psychology”. Here is another quote, from a reputed cognitive science specialist, who convinced me about the need for a no semantics point of view with his article “Brain a geometry engine”. The starting point is that what almost everybody describes as the Internet of Things is actually an Internet of Objects. We don’t want an Internet of Objects, because that would be only the usual accumulation of gadgetry and fads, i.e. only a very limited and uninspired construction. It is as imaginative as a big budget movie or as tasty as a fastfood menu. Because reality is not objective. Reality is made of things, i, e. discussions between us humans about everything. When a certain agreement (or boredom, or faith, etc) is attained in the discussion, the said thing dies and dries into an object. Discussions between humans thrive when individualities are respected and where there is a place which allows free mixing of ideas. A space. A theater. Not the theater-in-a-box of perception, where the space is a scene, the dual of the homunculus, the king of fallacies. Because a scene is not a thing, but an object. On the scene the discussion is replaced by an ideology (see this or, from the scenographer point of view this). Instead, a Greek theater under the sun could be a good starting point. As a machine which implements a theatrical distributed computing. separation of form from content: The principle that one should represent separately the essence of a document and the style with which it is presented. Applied to decentralized computing, this means no semantics. At this point the thread described here meets the one from the first half review: one of the discoveries of chemlambda, seen as artificial chemistry, is that it is possible to make this separation. This is something which could be read in parallel with the passage I commented in the post The front end visual system performs like a distributed GLC computation. the authors introduce the notion of the “Front End Visual System” . Of course, today I would say “performs like a distributed chemlambda computation”, according to one of the strategies described here. That is exactly what I call “no semantics”! But is much better formulated as a positive thing. Why is this a form of “no semantics”? Because as you can see the representation of the thing itself edits out the semantics, in the sense that “semantics” is redundant, appears only at the level of the explanation about how the brain works, not in the brain workings. But what is the representation of the thing itself? A chemical blizzard in the brain. 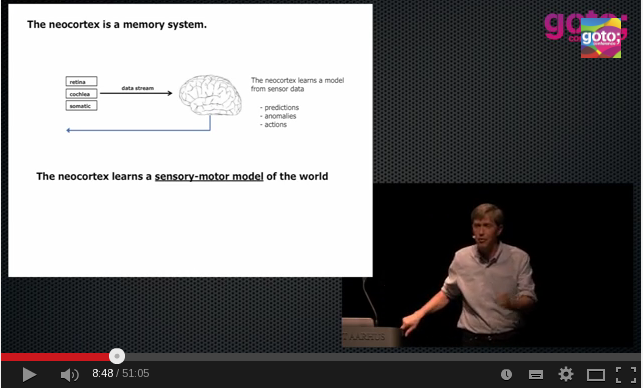 the sensory-motor model of the world is a learned representation of the thing itself. Remark that as previously, there is too much here: “model” and “representation” sort of cancel one another, being just superfluous additions of the discourse. Not needed. What is left: a local, decentralized. asynchronous, chemically based, never ending “computation”, which is as concrete as the thing (i.e. the world, the brain) itself. I put “computation” in quotes marks because this is one of the sensible points: there should be a rigorous definition of what that “computation” means. Of course, the first step would be fully rigorous mathematical proof of principle that such a “computation”, which satisfies the requierements listed in the previous paragraph, exists. Then, it could be refined. I claim that chemlambda is such a proof of principle. It satisfies the requirements. I don’t claim that brains work based on a real chemistry instance of chemlambda. Just a proof of principle. But how much I would like to test this with people from the frontier mentioned by Jeff Hawkins at the beginning of the talk! In the following some short thoughts from my point of view. While playing with chemlambda with the strategy of reduction called “stupid” (i.e. the simplest one), I tested how it works on the very small part (of chemlambda) which simulates lambda calculus. Lambda calculus, recall, is one of the two pillars of computation, along with the Turing machine. In chemlambda, the lambda calculus appears as a sector, a small class of molecules and their reactions. Contrary to the Alchemy of Fontana and Buss, abstraction and application (operations from lambda calculus) are both concrete (atoms of molecules). The chemlambda artificial chemistry defines some very general, but very concrete local chemical interactions (local graph rewrites on the molecules) and some (but not all) can be interpreted as lambda calculus reductions. Contrary to Alchemy, the part which models lambda calculus is concerned only with untyped lambda calculus without extensionality, therefore chemical molecules are not identified with their function, not have they definite functions. Moreover, the “no semantics” means concretely that most of the chemlambda molecules can’t be associated to a global meaning. Finally, there are no “correct” molecules, everything resulted from the chemlambda reactions goes, there is no semantics police. So from this point of view, this is very nature like! Amazingly, the chemical reductions of molecules which represent lambda terms reproduce lambda calculus computations! It is amazing because with no semantics control, with no variable passing or evaluation strategies, even if the intermediary molecules don’t represent lambda calculus terms, the computation goes well. For example the famous Y combinator reduces first to only a small (to nodes and 6 port nodes molecule), which does not have any meaning in lambda calculus, and then becomes just a gun shooting “application” and “fanout” atoms (pair which I call a “bit”). The functioning of the Y combinator is not at all sophisticated and mysterious, being instead fueled by the self-multiplication of the molecules (realized by unsupervised local chemical reactions) which then react with the bits and have as effect exactly what the Y combinator does. What is nice in this example is that it works without the Y combinator, even if it’s a game of recursion. But this is a choice, because actually, for many computations which try to reproduce lambda calculus reductions, the “stupid” strategy used with chemlambda is a bit too exuberant if the Y combinator is used as in lambda calculus (or functional programming). The main reason is the lack of extension, there are no functions, so the usual functional programming techniques and designs are not the best idea. There are shorter ways in chemlambda, which employ better the “representation of the thing itself is its own semantic interpretation” than FP. One of those techniques is to use instead of long linear and sequential lambda terms (designed as a composition of functions), so to use instead of that another architecture, one of neurons. For me, when I think about a neural net and neural computation, I tend to see the neurons and synapses as loci of chemical activity. Then I just forget about these bags of chemicals and I see a chemical connectome sort of thing, actually I see a huge molecule suffering chemical reactions with itself, but in a such a way that its spatial extension (in the neural net), phisically embodied by neurons and synapses and perhaps glial cells and whatnot, this spatial extention is manifested in the reductions themselves. Now, instead of a sequential call of duplication and application (which is the way the Y combinator is used in lambda calculus), imagine a well designed network of neurons which in very few steps build a (huge, distributed) molecule (instead of a perhaps very big number of sequential steps) which at it’s turn reduce itself in very few steps as well, and then this chemical connectome ends in a quine state, i.e. in a sort of dynamic equilibrium (reactions are happening all the time but they combine in such a way that the reductions compensate themselves into a static image). Notice that the end of the short movie about the neuron is a quine. For chemlambda quines see this post. In conclusion there are chances that this massively parallel (bad name actually for decentralized, local) architecture of a neural net, seen as it’s chemical working, there are chances that chemlambda really can do not only any computer science computation, but also anything a neural net can do.